The campaign of the Turkmenistani government against civil society activists, journalists and others who criticize the current state of affairs in the country shows no signs of abating. The Turkmen Initiative for Human Rights (TIHR), The Rights and Freedoms of the Citizens of Turkmenistan (RFCT), International Partnership for Human Rights (IPHR) and Memorial Human Rights Centre are alarmed about new reports of threats and harassment targeting critical voices, including most recently an attack on the elderly mother of the head of the TIHR. While the TIHR is based in exile in Austria, its director Farid Tuhbatullin has repeatedly received threats because of his human rights engagement and his organization’s criticism of Turkmenistani government policies. 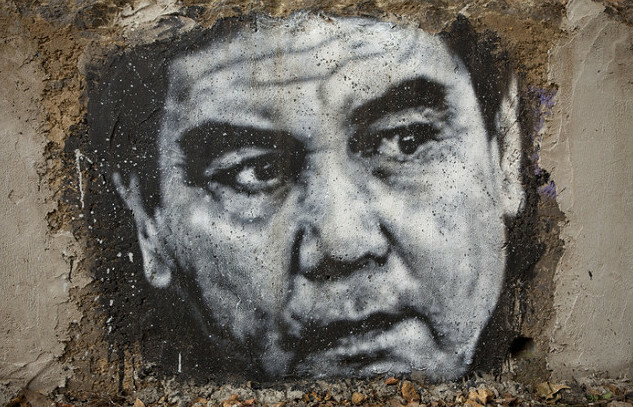 His relatives in Turkmenistan have also been singled out for intimidation and harassment. In the night of 28-29 October 2017, unknown perpetrators threw stones and bricks at the windows of the apartment of his 76-year-old mother Khalida Izbastinova in the city of Dashoguz in northern Turkmenistan. This resulted in several broken windowpanes. His mother, who lives alone in the apartment, fortunately did not sustain any physical injuries but the incident frightened and upset her, and an ambulance had to be called for her. Police also arrived to the spot and questioned her, and an investigation was opened but has not produced any results so far. Izbastinova’s phone connection stopped working in the evening of Saturday 28 October and did not work for several days. “There is little doubt that this appalling attack on the mother of our colleague and friend was retaliation for his legitimate human rights work. The Turkmenistani authorities must ensure that it is promptly, thoroughly and impartially investigated with a view to bringing those responsible to justice,” said Brigitte Dufour, IPHR director. The attack on Izbastinova is not the only case of harassment to have been reported in the recent period, and it fits into a longer-term pattern. In the context of the current economic crisis in Turkmenistan and Ashgabat’s hosting of the fifth Asian Indoor and Martial Arts Games in September 2017, the government has stepped up measures to rein in criticism. In spite of the crisis, the authorities invested billions of dollars into the Asian games, seeking to use them to improve the country’s international image while putting pressure on those who challenge government propaganda and obstructing their communication with others in and outside the country. “The Asian Games brought Turkmenistan into the spotlight and the international community was reminded of the existence of this highly isolated Central Asian state. Now, the attention has faded, but as the attack on my mother shows, the government remains intent on silencing those who dare to express disapproval of its arbitrary and repressive policies,” said Farid Tuhbatullin, director of the TIHR. Galina Vertyakova, a social media activist, has faced renewed pressure because of social media comments critical of government policies. The RFCT learned that four national security officers visited her in her Ashgabat home on on 22 October 2017, accusing her of disseminating “false” information and threatening her. One of them said that it “would not take much” for them to have her killed. Vertyakova was previously detained in October 2016 and, following a quick trial, sentenced to three years in prison for allegedly extorting a house management representative. In reality, she was being punished for her social media posts, including on a government order requiring residents of Ashgabat apartment buildings to dim their windows to “improve the architectural appearance” of the houses. In December 2016, she was paroled and released, but she remains under the radar of the security services. Animal rights defender Galina Kucherenko, who has used social media to protest against the brutal methods used by Ashgabat authorities to get rid of stray dogs and cats, is subjected to ongoing surveillance, with a car parked outside her home keeping track of all of her movements. Similarly to in Vertyakova’s case, her internet and mobile connections have been disrupted. She has also repeatedly been attacked on social media by users posing as defenders of the regime and she has received threats both on- and offline. In summer 2017, an unknown individual claiming to be a law enforcement official threatened her on the phone, saying that she will be held responsible for “criticizing” and “lying about” President Berdymukhamedov. Nataliya Shabunts, an outspoken civil society activist who cooperates with the TIHR and publishes articles critical of the authorities in her own name, has similarly been subjected to ongoing surveillance in recent months and her internet access has been cut off. In August 2017, she was assaulted in the street by a group of women, who yelled racist slurs at her and told her to leave Turkmenistan. Radio Free Europe/Radio Liberty (RFE/RL) correspondent Soltan Achilova, who has reported on the impact of the economic downturn, has also recently been under constant surveillance and her internet and mobile phone access has been blocked. She has repeatedly been attacked. In July 2017, she was warned and physically prevented from taking photographs by unknown assailants on several occasions. In addition, her children have faced harassment. Other RFE/RL correspondents have been criminally prosecuted because of their work. The service’s correspondent Khudayberdy Allashov and his mother remain under police supervision after being given suspended three-year prison sentences in February 2017 for possessing chewing tobacco, a criminal offence that is not known to previously have resulted in convictions. Saparmamed Nepeskuliev, a contributor to RFE/RL and the Alternative Turkmenistan News, remains behind bars on charges believed to be retaliation for his work. In August 2015, he was sentenced to three years in prison for unlawful possession of pharmaceuticals. “We urge Turkmenistan’s international partners to prominently raise the cases of these and other individuals who are threatened, harassed and pursued by Turkmenistan’s authorities because they speak out about injustice and oppression. They badly need support from the outside world,” said Geldy Kyarizov, chief editor of the RFCT, an exile organization based in the Czech Republic. Relatives of Kyarizov, a former political prisoner who left Turkmenistan in 2015, have also been subjected to pressure following his departure. Earlier this year, the security services pressured his younger brother Bayram Kyarizov into making a video appearance, denouncing him and accusing him of betraying Turkmenistan and its government. “Turkmenistan’s international partners should use any opportunity to remind the authorities of their obligation to facilitate rather than stifle public discussion on challenges facing the country, including social and economic ones. Only international attention can help ensure an end to the current downward spiral,” said Vitaly Ponomarev, director of the Central Asia programme at Memorial Human Rights Centre.